Sure in a Christmas Carol, Ebenezer Scrooge is visited by three Spirits/Ghosts. 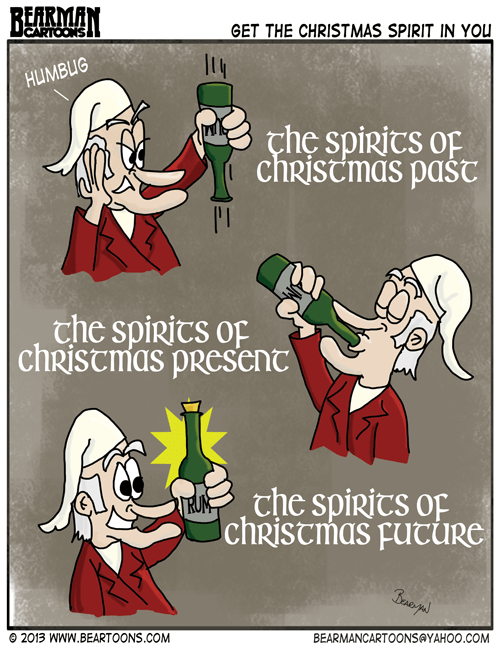 What if the spirits that were foretold by his deceased partner Jacob Marley turned out to be alcohol? May you all have a very spirited Christmas (or whatever you celebrate). May the spirits of Christmas be with you! Something tells me Scrooge had more than three sprit visitations. Well he did start having hallucinations. Ha – I never thought of those spirits. Very powerful spirits, they made the room spin for me once. Ok maybe more than once. But did your life flash before your eyes? Hahaha. This kind of spirit makes for a happier Scrooge! The spirits of Jack, Jim and Jose! Here’s to a Merry Christmas to you, bearman! Too much and you’ll be bowing to the toilet spirit. Absinthe hadn’t been outlawed yet in Victorian England, and was probably the most plentiful and cheapest spirit on the market aside from fortified wines. Of course, it would be obvious if we had the missing chapter where Dickens writes about Scrooge moving to the English countryside and becoming an impressionist painter…. I shudder to think what it was made from. Oh I miss the spirits of any holiday! Luckily there are the memories. Not to mention the joy in waking up Christmas morning without a champagne hangover. There’s nothing amusing about chopping onions, clattering about with pans and preparing raw turkey to get those juices flowing. And by juices I mean bile. May you have a fabulous holiday Bearman! Your strip has brought many smiles and food for thought throughout the year. I think old Scrooge was full of sprints when he felt visited , LOL! The past would be the most sad, just empty. Those Spirits. Ain’t Christmas without ’em. I’m sure there are a LOT of Ebeneezer’s who are visited by those kind of spirits every year! Maybe even everday! Ha! I think it makes a lot more sense now. Maybe a remake would show a stash of bottles in his flat. Why do you think he only lived in one room of that massive house. He would be a likely suspect. Probably makes for a more interesting story. Looks like Christmas Future involves puking all morning December 26th!